Grizzly Bear: An In-Studio Performance Hear songs from the Brooklyn-based group's hotly anticipated new album, Veckatimest, in an in-studio session at WNYC, streamed live at NPR Music. Hear Grizzly Bear play songs from their last album, Yellow House, in a session recorded at KEXP. The Brooklyn band Grizzly Bear releases one of the year's most hotly anticipated albums next week, but fans can hear some of its songs sooner than that: On Thursday, May 21, the group performed a special acoustic set, including material from Veckatimest, when it opened WNYC's American Music Festival with a live in-studio broadcast and webcast. Grizzly Bear performed new songs in the studio, with host David Garland welcoming the band and asking its members about their new music. 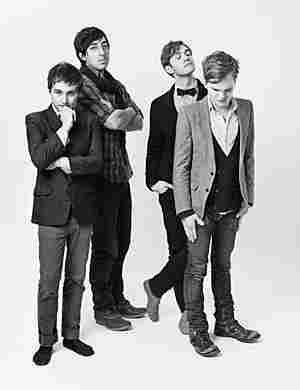 Grizzly Bear can be loosely described as a rock group, but its adventurous, unusual songs have led to its members performing concerts with the Los Angeles Philharmonic and the Brooklyn Philharmonic, and the band's album Yellow House made The New York Times' list of the top CDs of 2006. With lyrics that abstractly imply shifting personal relationships — alongside music that's full of angles, shadows and flashes of color — it's easy to imagine songs that hardly hold together. But somehow, these tenuous elements combine to form music that's powerful and engrossing.